CSA Hygiene can provide Builders Cleans and Post Refurbishment Cleans to Builders, Designers, Architects, Refurbishers and Private Individuals alike, in all major areas across the UK. 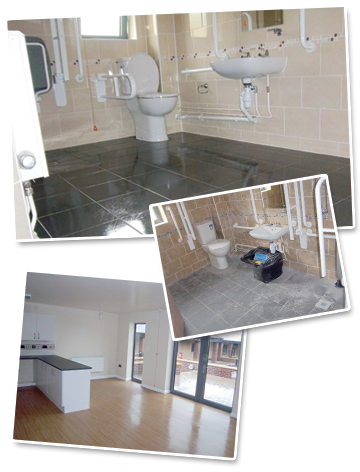 We not only provide the initial Builders Clean and final Sparkle Clean but can provide ongoing site cleaning to site offices and welfare facilities (canteens, washrooms, and locker rooms). This cleaning service is provided mainly for industrial units and the cleaning of their external cladding which can be carried out in a number of ways depending upon the cleaning problem. It may require hands on cleaning which is labour intensive, time consuming and normally involves some form of access equipment. It may be that the cladding is just dirty from polluted air and rainwater in which case it is less labour intensive and a faster process. The cladding in this situation will be cleaned using a 'reach and wash' system identical to that used by window cleaners. Gutter cleaning is carried out from the ground using the latest in technology to make the cleaning safer and quicker. If the guttering is heavily laden with dirt and plant growth then this has to be done by hand using some form of access equipment. regular maintenance of gutters and down pipes negates this problem and will reduce on going maintenance costs. As we use 'reach & wash' for cladding cleaning it also enables us to carry out commercial window cleaning.